Shure UK Senior Applications Engineer, Tom Colman explores rechargeable battery options for wireless microphones - moving from standard disposable batteries to modern integrated rechargeables. 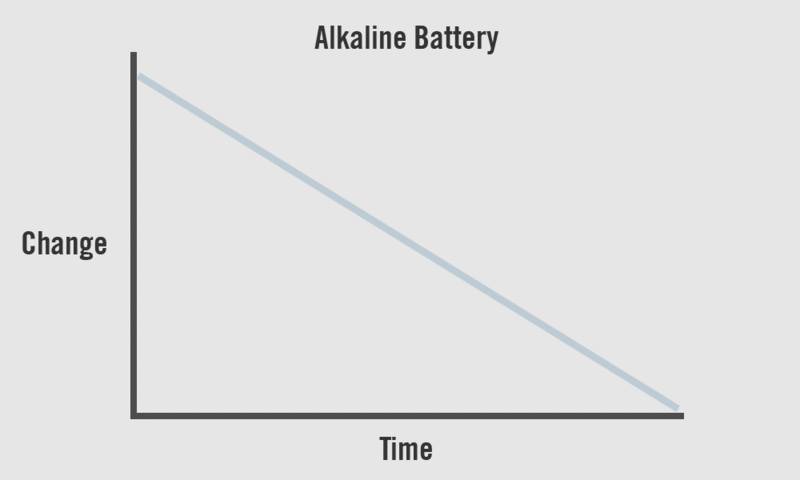 Alkaline batteries will discharge at a very linear rate, meaning power will reduce evenly throughout the life of the battery. So let's say we have a fully charged battery with five indicator bars. In the case of alkaline disposable batteries, power will discharge at the same pace when at bar five or bar one. In the case of standard consumer rechargeable batteries, the battery performance is much less predictable. The discharge rate is not linear and is likely to reduce faster towards the end of the battery cycle. This unpredictability makes standard consumer rechargeable batteries unsuitable for professional productions. Knowing the historic issues with rechargeable technology, we (Shure) set out to develop a reliable rechargeable system for the professional audio industry during the development of our high-end Axient wireless system. The result was an advanced power management system — based on medical-grade Lithion Ion cells — that introduced real-time monitoring and lifecycle management to batteries and chargers. Since the launch of Axient around five years ago, much of this advanced wireless technology is now available (where possible) across the Shure portfolio of wireless systems. Battery Health - The overall capacity of our battery compared to when it was new. Cycle Counts: This represents the amount of times our battery has completed a full cycle from 100% down to 0% and back up to 100%. This reading is cumulative, meaning it could also represent a cycle of 100% down to 90% repeated ten times. It's estimated that when a battery has completed 500 cycles it will still have a battery health reading of around 80%. That's a lot of AA batteries saved from landfill! By using a microchip in each battery, we know exactly how much capacity is remaining through a real-time reading in hours and minutes. This reading is accurate to within 15 minutes, and therefore, if your battery is showing 1-hour remaining and the event is 30 minutes long, you can be confident the battery will last for the duration. Marc forms part of our Pro Audio team at Shure UK and specialises in Digital Marketing. He also holds a BSc First Class Hons Degree in Music Technology. When not at work he enjoys playing the guitar, producing music, and dabbling in DIY (preferably with a good craft beer or two). Whiteboard Sessions cover a wide variety of best practice operating principles surrounding the mysterious science of wireless audio. We look at topics such as intermodulation, how to properly coordinate a wireless system, how to troubleshoot, and even topics around antennas and cabling. Senior Product Management Specialist, Stuart Stephens explains wireless companding and how it works. Shure UK Project Engineer, Stuart Stephens explores digital wireless latency and what causes latency in a digital wireless system. Shure Senior Applications Engineer, Tom Colman explains some of the basic differences between digital and analogue wireless systems. Marc Henshall, Senior Marketing Specialist, Pro Audio at Shure UK explains the two most common causes of RF interference. Shure UK Pro Audio Group Manager, Tuomo Tolonen explains what whitespace devices are. Senior Product Management Specialist, Stuart Stephens shares some insight in RF antennas and best practices on placement. Project Engineer, Stuart Stephens talks us through the importance of visualising the RF landscape. Shure Applications Engineer, Tom Colman answers common questions about cable components for your RF setup. Shure Applications Engineer, Tom Colman explains the often misunderstood concept of intermodulation. Tuomo Tolonen, Pro Audio Group Manager at Shure UK, explains what's happening to the UHF space and how it affects you. Whiteboard Sessions cover a wide variety of best practice operating principles surrounding the mysterious science of wireless audio. In this video series we cover one pro audio topic each episode to help you expand your knowledge. GLX-D Digital features intelligent technology and convenient rechargeable power options for musicians who run their own sound. Stereo personal monitoring system with SE112 Sound Isolating Earphones, rack mount, 1/4 wave antenna, power supply, zippered bag, and 2 AA batteries. ShurePlus™ MOTIV Video is a free iOS application enabling users to record with uncompressed audio for video. Audio conferencing processor offers IntelliMix DSP algorithms optimized for audio/video conferencing applications. Connecting any XLR mic or 6.3mm instrument to iOS, Android, Mac or PC, creating a high-quality audio portable recorder for vocals and instruments.